Automobiles are usually the second largest expense people have in their lives. Shouldn’t we all be able to protect these investments in a reliable, cost-effective way? That’s what Dorman has believed since 1918. Their mission is to give repair professionals and vehicle owners greater freedom to fix cars and trucks by releasing more exclusive, labor-saving and cost-effective replacement solutions than anyone else. At their heart, they do two things: supply new products that match the fit, function and performance of original equipment manufacturer parts, and reengineer parts to fix common flaws in original part designs. Their talented team is constantly evaluating what parts are failing on today’s vehicles, so that we can steadily deliver reliable replacements. 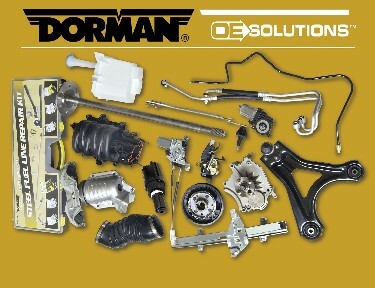 ​Pdi carries a full line of Dorman OE Solution products, as well as lug nuts and wheel studs, oil and transmission fluid lines, and replacement sway bar kits.